Indian Lake Ohio Docks and Lifts are popular on the site formerly known as the Lewistown Reservoir. Many cottages and lake homes surround Indian Lake located in Western Ohio. With over 6300 acres of water, the lake is a desination for leisure activities and recreation. The lake is stocked with fish including Saugeye and is home to several fishing tournaments and clubs participating in annual events. With so much activity on Indian Lake, a boat dock and lift is a necessity! Metal Craft Stationary Docks are a popular choice for residents living around Indian Lake. Stationary docks are perfect for areas where water levels fluctuate minimally during the season. Dock sections are modular and can be reconfigured and added on to season after season. The all-aluminum construction allows for easy removal and re-installation year after year. Metal Craft decking is made from aluminum extrusions with a poly enamel finish featuring our non-skid technology providing sure footing when entering or exiting water craft. The unique heat sink technology of our extrusion provides for an ambient walking surfaces versus other docks made of plastic or wood. Metal Craft docks require minimal maintenance and will last a lifetime! For a quality product for your lake front property, consider contacting our authorized dealer, Gene’s Marine Bait and Tackle for more information. 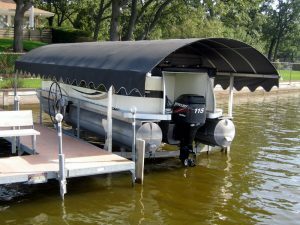 Metal Craft offers aluminum boat lifts and PWC lifts for use with or without a Metal Craft Dock. Metal Craft vertical boat lifts accommodate watercraft up to 5,000 lbs. 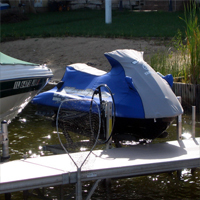 Our aluminum boat lifts feature a deep “V” design allowing entry to the lift in shallow water. Our side-trussed design provides extra strength while providing superior protection for watercraft. Standard features include stainless steel cables, nylon pulleys, and stainless steel fasteners. Additional accessories such as electric boat lift motors make operating your lift as easy as turning on your car. Deluxe bunks, side guide-ons and pontoon lift kits make docking easy even for the newest of skippers. Personal Watercraft Lifts or PWC’s are available in two models and will hold watercraft up to 1200 lbs. Our cantilever jet-ski lift allows for easy docking in the shallowest of water. A three-pulley system and galvanized aircraft grade cable require minimal maintenance. Metal Craft PWC lifts feature the Dutton-Lainson winch for smooth lifting and the Lorenz 26″ wheel makes for smoother operation. Optional accessories include a winch post extension kit and Lift Tech Marine power motor. Contact Benny at Gene’s Marine Bait and Tackle for more information on selecting the right boat lift or jet-ski lift today. Metal Craft Docks has been designing, engineering and manufacturing dock systems for over 80 years! We’ve made few changes over the years in our design so even if you own a dock that is 50 years old, the parts and accessories are still available for your system! Metal Craft Docks is a family owned and operated business priding ourselves on exceptional quality, design and outstanding customer service. Metal Craft Docks and Lifts are made entirely of aluminum so they are naturally light-weight making installation and removal for storage easier. We are proud of the craftsmanship that goes into every one of our products manufactured in our Mentor, Ohio facility. When you purchase a Metal Craft Dock and Lift you are making an investment. We know you will be happy with your Metal Craft purchase for decades into the future! Gene’s Marine Bait and Tackle has been servicing Indian Lake and the surrounding area for over 25 years. In December of 2016, Gene’s Marine Bait and Tackle became the authorized Metal Craft Dealer for Indian Lake. Please contact Benny at 937-381-6139 or stop at the marina to discuss your Indian Lake Ohio docks and lifts needs.